Let me stop there. That paragraph is straight-up plagiarism. Sorry. Every word in it was lifted verbatim from an editorial that appeared 76 years ago in the New York Times, when the U.S. economy was emerging from another financial crisis, stuck in another lost decade, dealing with another identity crisis, looking for another business to make us rich. The scavenger hunt for the future of the U.S. economy is a national past-time. Today, it's wearables, or green manufacturing, or biotech, or Uber for Everything, or wearables. What was the imagined future of the U.S. economy months before the beginning of World War II? It was ... Disney cartoons. Yup. 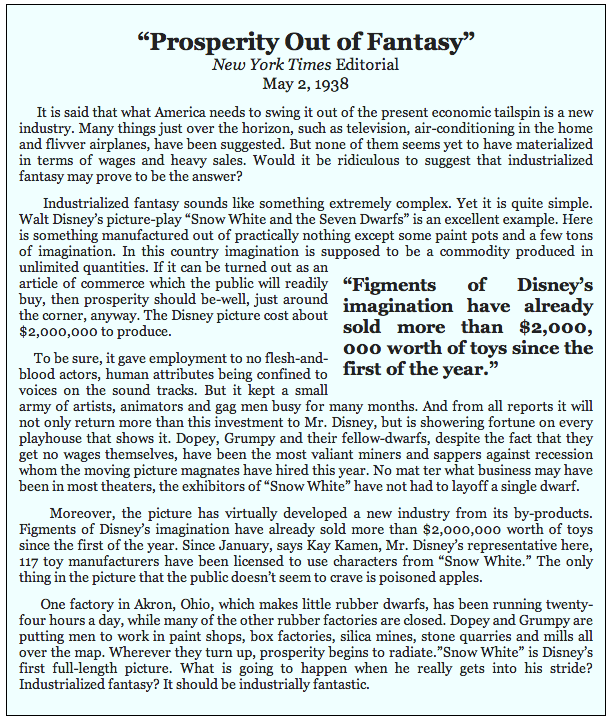 Snow White and the Seven Dwarfs had premiered months earlier to national renown and exhilarating toy sales that presaged a new future for commercializing American art: making toys out of movies. Here's the full, fascinating editorial. As it turned out, "industrialized fantasy" didn't save the U.S. economy. Fantastic industrialization did. The U.S. industrial index, which had just fallen to a five-year low in 1938, would triple by 1945 and double again by 1965. Americans returned from World War II, collected war bonds, built highways, moved to suburbs, bought homes and garages, filled them both with lots of stuff, and went to work in heavily unionized factories. Births, wages, exports: Everything rose in the strange, idyllic, post-war miracle of the 1950s. To the Times' credit, movies would be the third biggest retail category of the 1950s, but tickets and toys would lag far behind suburban homes and cars, which transformed the national economy. And yet, the Times was right to see something revolutionary in the first feature-length Disney movie—certainly for the movie industry, if not for the U.S. economy. As theater audiences declined in the 1960s and 1970s, merchandisable characters have become a guiding light for studios seeking to build durable and profitable franchises. Walt Disney's instinct to build intellectual properties that could give life to toys, theme parks, and licensed songs outside the cineplex was ahead of his time. His focus on young audiences was unique in the 1930s. Now that the most important demographic for movie openings is teenagers, it looks prescient. But predicting that Disney's vision would rescue the entire economy from a malaise seems a little far-fetched in retrospect. Our appetite to predict the future far outstrips our capacity to do so. I predict that won't stop us from trying.